June 29, 1989, LG Crabo. 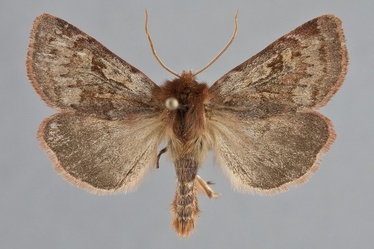 Xestia tecta is a strikingly patterned red-brown medium-sized noctuid (FW length 16 - 18 mm) with a slightly pointed forewing that flies near timberline in the mountains of northern British Columbia during the summer. The ground color of the forewing is rich red-brown. They are suffused with light gray and ochre scales producing lighter areas that appear to be multicolored, least heavily in the median area which appears darker and redder than the rest of the wing. The cell and shading medial to the subterminal line are darkest red-brown. The transverse lines are dark red-brown to gray-brown, single. The antemedial line is relatively smooth and straight, but the postmedial line is strongly dentate with the tips of the teeth accentuated with dots in many individuals. The subterminal line is smooth and pale. The three spots are similar to the lines on the outside and have an inner ochre line and filling of ochre scales. The orbicular spot is variable, sometimes small and round but more often elongate and irregular. The reniform spot is relatively narrow and upright. The claviform spot is small to moderate in size but usually evident due to lighter filling. The hindwing is medium red-brown with a heavy suffusion of smoky gray scales. Its fringe is rosy pink. The head and thorax are covered in red-brown hair-like scales. The eyes are reduced in size. The male antenna is strongly biserrate. This species resembles Xestia okakensis which is the only species with which it is likely to be confused in its northern distribution. 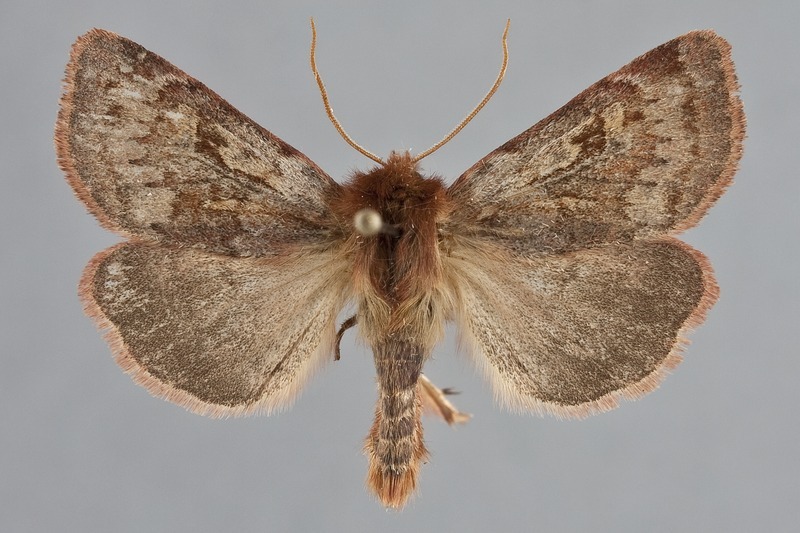 Xestia okakensis is usually smaller and smoother appearing, with more even red-brown color to the forewing. Its postmedial line is smooth or weakly scalloped, lacking sharp teeth as in X. tecta. Its reniform spot is rounded or oval with a weak or absent lateral indentation unlike the narrow upright spot of X. tecta. Xestia is a large and diverse genus found throughout temperate, alpine, and arctic portions of the Northern Hemisphere. The genus is subdivided into three subgenera, Xestia, Megasema, and Pachnobia, by Lafontaine (1998). The genus is defined by a thumb-like ventral extension called the pollex which arises from the base of the clasper of the male valve. Over half of the North American species are found in the Northwest. 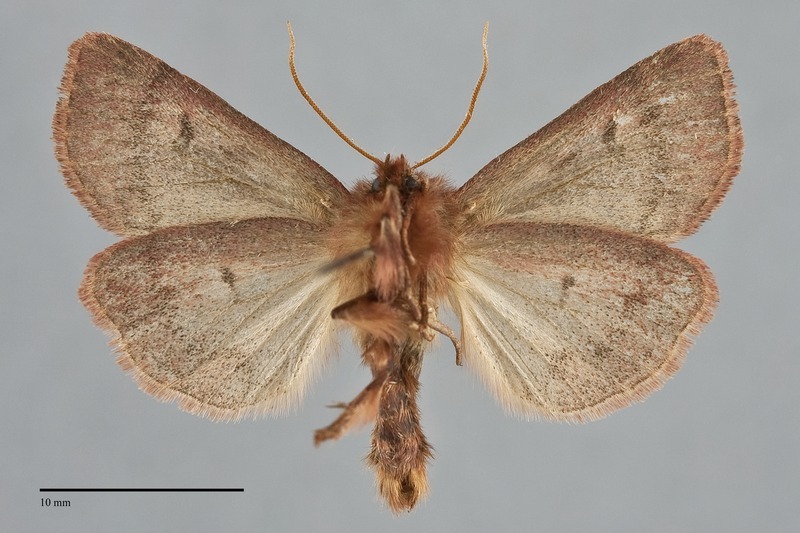 Xestia tecta belongs to the subgenus Pachnobia. Larva is smooth, mottled reddish brown with a broad white lateral band. It is illustrated by Lafontaine (1998). This species is widely distributed on wet arctic shrub tundra across the northern regions of both Eurasia and North America, extending southward to subalpine forests at high elevations in the Rocky Mountain region. Xestia tecta is limited to northern British Columbia in our region. It has been found at Pink Mountain but likely occurs on other mountains since it is known from adjacent southwestern Yukon Territory. This species has a large Holarctic distribution. It occurs across the subarctic Northern Hemisphere from Scandinavia to Labrador. The southern limit of its range in North America is northern British Columbia and James Bay of Hudson Bay. This species feeds on hardwood shrubs such as huckleberries (Vaccinium spp.) in the Ericaceae and dwarf birch (Betula nana) in the Betulaceae. The males of X. tecta are nocturnal and come to light in areas where it gets sufficiently dark to attract moths, while females are active in the late afternoon. This species occurs in July and early August.